Small on size and large on multitasking, Panasonic’s smartly designed microcomputer-controlled Fuzzy Logic rice cooker takes the stirring, hovering, checking, and temperature adjusting right out of dinner preparations–leaving little for you to do but to enjoy delicious home-cooked meals. With a capacity of up to 5 cups of uncooked rice (model SR-DF101) or of up to 10 cups of uncooked rice (model SR-DF181), the rice cooker works well for healthy side dishes and dinners for one or two people, as well as large feasts when cooking for the family or entertaining friends. 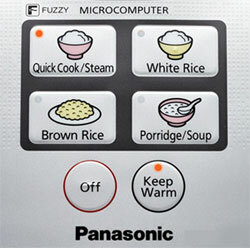 Panasonic’s easy-to-use microcomputer-controlled rice cooker features a simple, pre-programmed control panel with four large buttons for selecting up to six menu options: quick cook, steam, white rice, brown rice, porridge, or soup. 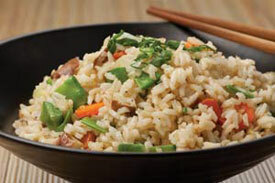 Create delicious rice dishes and much more. Choose one of the rice settings to cook anything from basmati, jasmine, or arborio rice to hearty wild rice, brown rice, or short- or long-grained rice. The rice cooker cooks the satisfying grain to restaurant-quality perfection, making it easy to create a fabulous main dish when paired with stir-fried veggies and tofu, stirred into soups, or fluffed with nothing more than butter and salt. Yes, it cooks rice, but it also does so much more. For a quick and healthy addition to grilled chicken and dinner rolls, just fill the rice cooker’s included steamer basket with green beans or fresh broccoli from the farmer’s market or zucchini and pea pods from the backyard garden. Then press the quick cook/steam function and you’re well on your way to appetizing side dishes. Short on time in the morning? Load up the rice cooker with oatmeal, grits, or other hot cereals and water or milk for a low-effort, soul-satisfying breakfast before heading out the door. For precise and delightfully consistent results every time, the rice cooker’s advanced Fuzzy Logic technology automatically adjusts the power and cooking time–making the art of rice cooking practically foolproof. The rice cooker’s automatic shut-off function ensures peace of mind and prevents overcooking, while its handy keep-warm setting activates automatically when cooking is complete, holding contents at an ideal serving temperature for up to 12 hours. 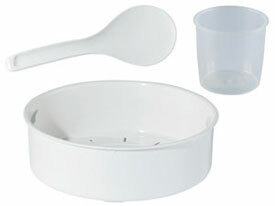 Along with the steaming basket, the rice cooker provides a special measuring cup for portioning the desired amount, as well as a non-scratching rice spoon for authentic Asian-style service. 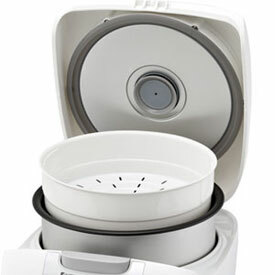 Other highlights include push-button lid release, a domed lid that prevents accumulated water from re-entering the contents, a nonstick-coated pan for simple cleanup, a detachable power cord, and an attractive, compact design that fits neatly on a countertop, kitchen island, or dinner table for convenient serving. 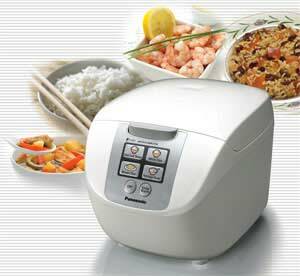 Awarded the Good Housekeeping Seal of Approval, Panasonic’s microcomputer-controlled Fuzzy Logic rice cooker effortlessly cooks up main dishes, sides, snacks, hot breakfasts, and a host of other meal options, making it a useful addition to any busy kitchen. Note: Do not clean or rinse the rice in the rice cooker pan, but use an outside bowl. OK if you don’t need to keep rice warm more than a day. Cooked rice dries out in as little as 24hrs when unit is in keep warm mode. My Tiger JBA-T10U (made in Japan) in keep-warm mode can keep rice moist for nearly a week. Great Cooker, Great Value This is an excellent product and, I think, also excellent value. Makes great rice without any hassle and also “slow cook” dishes. We use it on an almost daily basis and, so far, absolutely the only complaint I have is that it is just about impossible to see the water markings on the inside of the (very black) cooking pot. But, having a flashlight in the kitchen is probably a good idea anyway!